And to think that I ever doubted in God's ability, that I didn't believe what He said He'll do for me as promised in His Word... well, no more of that. I don't know about what you'll feel, but after watching this video, not only was I filled with joy because of how warm the story is, I was filled with joy because I know that God did all this because of His love for this son of His. 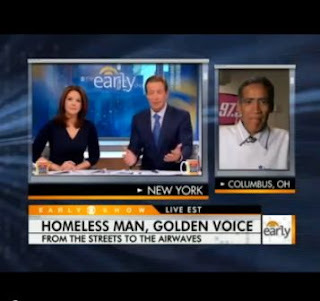 Ted Williams is an ex-homeless man who God has blessed with a Golden voice. Watch the video below. I wanna hear this guy as a sports commentator... what a voice!!!. God takes care of His children and I'm very proud to be one of His. Psalms 11:7 - For the LORD is righteous, he loves justice; upright men will see his face. God is indeed worthy to be praised.